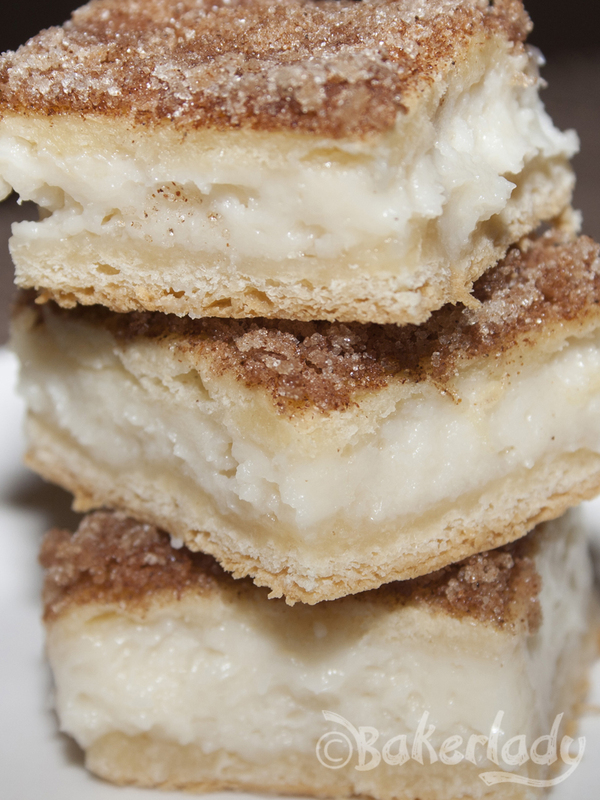 Who would have thought that cinnamon sugar, puffy warm bread and cream cheese filling would blend together in a totally divine delicious way? I always think of cheesecake with fruit or chocolates, never did I think of combining it with flaky golden pastry and sweet cinnamon sugar. Mind. Blown. Mouth. Happy. I love sopapilla and I adore cheesecake so while the combo of the two of them unheard of, it was a must try for me. 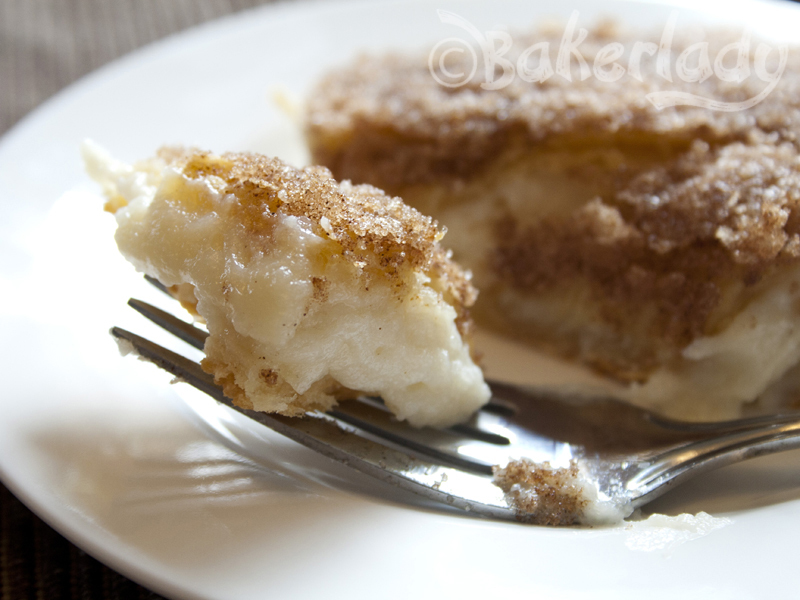 Using Pillsbury crescent dough made this dessert a snap to throw together and I could hardly wait to get it out of the pan and into my belly. This stuff baking filled my house with cinnamony goodness. Excuse the varying light on these photos. I was trying for a sunlight coming in the window deal and then switched to using my flash. Another side note…why does my spell check ALWAYS try to correct “dessert” to “desert”? Stupid spell check. Surely people blog more about desserts than deserts? Right? I was watching my neighbor’s daughter for the afternoon and this was a perfect after-school snack. We sat in the kitchen together and moaned aloud at the deliciousness of this treat. She said the interior tasted like cream cheese frosting. Oh yeah. It was creamy and a little sweet and oooooh so good. How can you go wrong with all that goodness is wrapped on either side with doughy puffed pastry? I cut the first few pieces into slabs, but when my husband came home he had the genius idea to cut the squares a little smaller so they’d be bite sized. Cheesecake bites? Um, you sir are my new hero! No fork needed, they held up perfectly to just pop in your mouth! 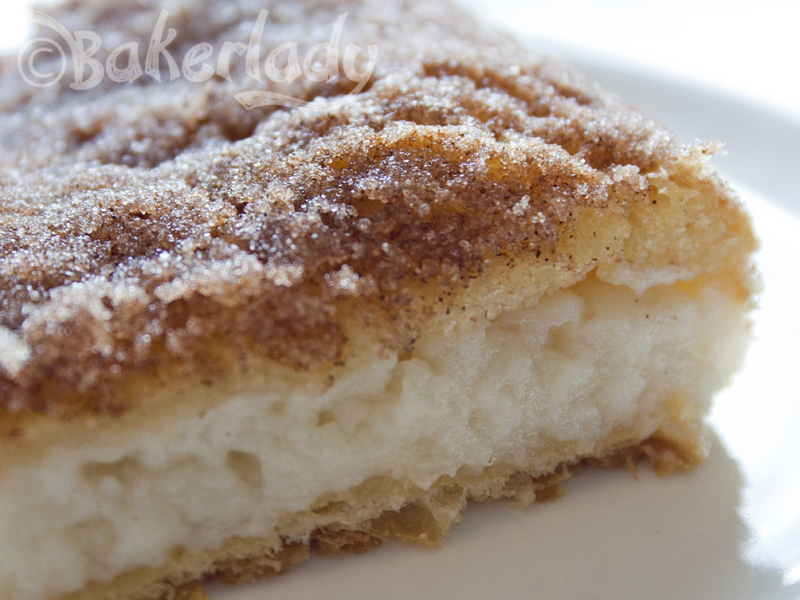 Hi, Sopapilla Cheesecake looks so good. I really love you blog and all the recipes. can you use a pillsbury biscuit can or would that not work? You could certainly try a can of biscuits. I’d see if you can split them in half horizontally though – otherwise, I think they’d rise/puff up too much. Super easy and super yummy! Will make them again…thank you for sharing! After baking do you refridgerate? If you aren’t going to eat the whole tray immediately (like I did) – yes, you’ll want to refrigerate them. What kind of cinnamon? (Sorry, I’m new to baking) is ground cinnamon ok? Ground cinnamon is perfect! Enjoy your new adventures in baking! You’ll love it! It was really fun and easy to make- perfect for a late night study group 🙂 but I think I did something wrong- the cinnamon and sugar were this really dark brown color when I took it out of the oven. Was I supposed to bake the cheese cake, then add the sugar? No, you bake them with the sprinkling of cinnamon sugar already on top. They are supposed to turn out a pretty dark golden brown. Have you ever assembled this and refrigerated it before baking? I’m wondering how that would come out. I haven’t with this recipe, but have assembled other things with the pillsbury dough and had it not quite puff up quite right after being in the fridge overnight. Oh snap! Well, I assembled it around 1:00pm and will bake it around 5:30pm. I’ll let you know how it works out. I’m sure a few hours will be ok. Do let me know though! It came out perfectly! I was planning to take a picture but it was devoured too quickly. Good stuff! This recipe was a staple back in Nov./Dec. for my family. My 16 year old son made it more than I did at one point. Today I am getting a menu ready for some scrapbookers. This recipe is now on it, and they are going to love it! Thanks for bringing it back into focus ladies! Kelli, the same thing happened to me. I wanted a photo or two of it, but it was gone. A friend of ours introduced this to us not that long ago…. I made it this weekend and it’s beyond delicious. I also love putting raspberry (or strawberry) jam on top of the cream cheese. I’d imagine a thin layer of chocolate would be pretty phenomenal here, too. Mmmmmmmm. Jam on top! That sounds amazing! I made this for dessert along with a Mexican dinner, fantastic! I have made 3 now in less than 1 week. I took 1 pan to a birthday party over the weekend & EVERYBODY wanted the recipe! made this today. Found the recipe on Pinterest. Incredibly easy with very few ingredients. It was delicious!! bringing to work for a bunch of hungry nurses…will let you know what they think. You’re gonna be sooooo popular at work! Pinterest. Tastes very good with honey! 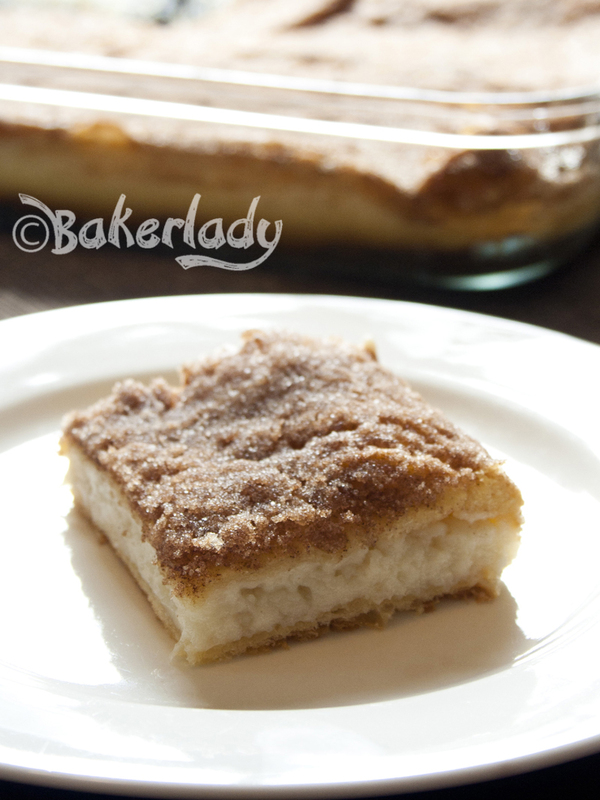 Another quick step- you can find cinnamon sugar in the baking aisle so it can just be sprinkled right on top, no mixing needed. Can you use puff pastry sheets instead? Probably. I haven’t tried it, but I don’t see why it wouldn’t work! I have made this several times. I like putting honey on top of mine after it is baked. Really makes it taste like a sopapilla. It is delicious! I set a bottle of honey out for the ones that want to add it to their piece. Can you suggest a lower sugar or no sugar version? My boyfriend is diabetic. I was wondering if I could use half the sugar and see if it tastes good or use half white sugar and half brown sugar? You could always try sugar substitutions. I’ve never tried them so can’t really say if they’d work or not. I’ve made this with sugar substitute inside and real on top, works fine. I also used lemon flavoring instead of vanilla by accident and it was great! I am a Weight Watchers what do you think about using low fat or fat free cream cheese and stevia in place of the sugar in this recipe? Wow this is awesome and dangerously delicious!! My husband brought home the recipe I made it and almost had to put a lock on the fridge to keep me out of it!! Wouldn’t it be amazing if there were fridges with locks? I had this for the first time when I was in the hospital after having my son. A friend brought it to me. I didn’t want to share with anyone! I’ve made it several tomes at home and have added lemon zest and fresh lemon juice. It was heaven in a dish!!!! Makes me want some now! My husband loved this so much he asked to have it for his birthday. I was perplexed as to how I could decorate it for a birthday “cake”? Got creative! Made it into a “golf course”. You will have to see my pic! I also added salted caramel on top of cream cheese layer! That’s fantastic! What a great idea to use it as a golf course. I wonder if there’s a way to share pics on my site. If not, you can email them to me at contactbakerlady@gmail.com I’d love to see them! Question – is this meant to be eaten right away? If making to bring to an event can I make it ahead of time and refridgerate? Serving cold is fine? I would say that I should be eaten within 24 hours or so…but it’s delicious cold as well as warm. Yes. This tasted wonderful, but… I wish the directions had told me to let the butter cool some before spreading it on. My sugar/cinnamon mixture melted right into the butter and made a solid layer of dark brown crispy melted sugar. It also seemed like 1/4 cup of butter was way too much. I had to sop some of it back off with a paper towel. It doesn’t look anything like the pretty picture you posted. I promise I’ll try again, because it tasted sooooo good. 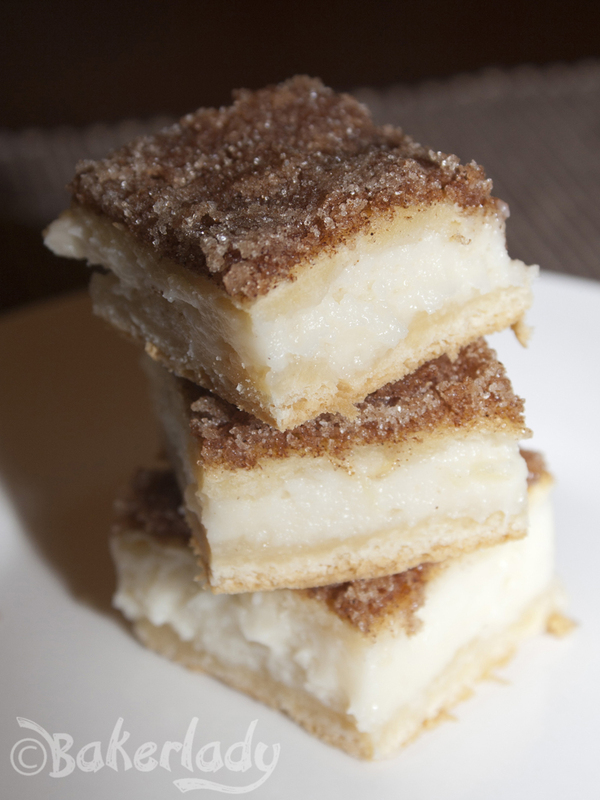 The first time I had these was in 1980, I remember it well and have been baking them ever since. The only thing I do differently is to drizzle some honey over the top after its nearly cooled, looks pretty and adds a bit of flavor. Don’t freak about the pools of butter, they will eventually bake right in. I have occasionally forgotten to take the butter out of the fridge and have melted it completely, added the cinnamon and sugar to the melted butter and then poured evenly over the top, still works perfectly. Once totally cooled they have a crispy top crust from the sugar crystallizing in the butter. Just delish! How much does 1 batch yield? I want to make these for a superbowl party where their will be about 30 or more people. why no egg in the cheesecake? It’s a quick and easy cheesecake-like middle. And technically, sopapillas are not and have nothing in common with can biscuits/crescent rolls…NOT the same at all. awesome recipe, my family loved it. I have been making this for several years and have these suggestions. Add 1 teaspoon cinnamon to the filling. I wanted more filling, and I like it better with 3 packages of cream cheese, with sugar increased to 1 1/2 cups. 2 teaspoons of vanilla instead of one. Low fat cream cheese works just fine. When I can find them, use the Pillsbury crescent roll sheets that have no perforations. The recipe given to me calls for a stick of melted butter mixed with 1/2 cup sugar and 1 tsp. cinnamon for topping to pour on top prior to baking. This recipe halves well for baking in an 8 by 8 also. Love this dessert and it great for parties that everone like and easy to make. I made this a few years ago, and my then-roommate and I decided, after just one large square apiece, to trash the rest of it. Not because it wasn’t good, but because it was dangerously delicious, and we had no one to share it with. Neither of us could afford to eat the whole thing, but we knew we’d never resist if we kept it around. She actually cried as she watched me cut it up and throw it away! You made my afternoon with this hysterical comment! Glad you found some others to share with so you could make more! I want to make this for 50 people for my church so timing is important. Do I serve this hot, room temperature, or serve cold after refridgeration? Does the crust loose its crunchy texture and get soggy after refridgeration though? Thank you, in advance for your reply. I’m hoping to make it tomorrow. Sorry I’m just getting to your question — I’ve never had this last long enough to know about the crust texture after refrigeration, but I would guess that it would lose some of it’s texture due to the moisture in the filling. I’ve eaten mine warm from the oven and at room temp. This went down very well at my recent Spanish themed dinner party. Very sweet, delicious with vanilla ice-cream. For us in the UK I used Jus-roll croissant dough – perfect. So delicious… The appearance doesn’t look that great, but the taste is what matters. I made these and they are addictive. I did make a slight change. In addition to the vanilla I added 1 teaspoon of lemon extract. It gave it a great lemony background taste. I also had to bake mind for 35 min. When I took it out at 20 min. the middle was very under cooked. The outer edge pieces were the best because the dough was slightly crispy. Yummy very easy to make. BTW my hand mixer wasn’t working so I had to hand mix. Though it was tiresome, the filling came out perfect.. I am going to try the Lazy Heath Bars next. Thanks for your site I really like it.